The Eddystone Lighthouse is situated on the Eddystone Rocks in Devon, England. The lighthouse, originally built in 1698, has been rebuilt four times - most recently in 1882. This tower was created by Henry Winstanley. The tower was significantly modified soon after completion - and what would be the final product was not created until 1699, some consider this final product to be the second Eddystone Lighthouse. The tower survived until the most powerful storm to ever hit the British Isles, so called the "Great Storm of 1703", destroyed it. Winstanley was actually on the tower at the time, as he had said he wished he could be on the reef in the greatest storm that ever blew under the face of heaven so he would see what effect it would have on his building, after the storm, no trace of him was ever found. This tower was built by John Rudeyerd in 1709, but differed from the first because he used shipbuilding principles in order to make the tower stronger. The lighthouse survived until a fire started by a candle inside it burned it down. This tower was revolutionary due to its construction material (which included granite and quick drying cement), and it established standard for future towers worldwide. Smeaton’s tower lasted for 127 years until the rock on which it was sited started to show signs of stress from the action of the sea and fissures started to open up in it, after the completion of a new tower, Smeaton's Tower was dismantled and transferred to Plymouth Hole as a memorial. Built by James Douglass, this tower was twice as tall as the original, and four times as massive. Douglass designed a special ship to carry massive granite blocks to build the lighthouse. For his work, Douglass was later knighted by Queen Victoria. 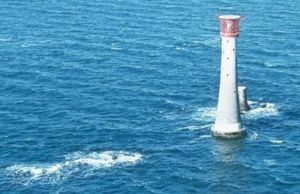 ↑ 1.0 1.1 1.2 EDDYSTONE LIGHTHOUSE HISTORY (English). Eddystone Tatler. Retrieved on 2007-09-30. ↑ 2.0 2.1 2.2 2.3 2.4 The Eddystone Lighthouse(s) (English). Polperro (2004-10). Retrieved on 2007-09-30. ↑ 3.0 3.1 The Great Storm of 1703. BBC. Retrieved on September 7, 2006. ↑ The New Eddystone Lighthouse (English). The Linda Hall Library of Science, Engineering & Technology (2002). Retrieved on 2007-09-30. This page was last modified on 2 April 2019, at 02:22.